Pin It Normally you see this type of parfaits with a medley of berries, but it can be done with pretty much any type of fruits. 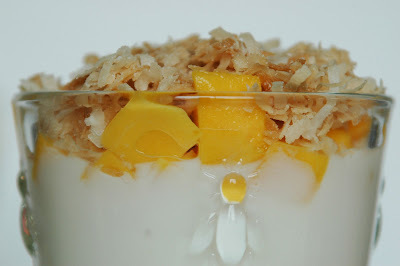 The mango I used was really ripe and sweet, just perfect for this kind of recipe. 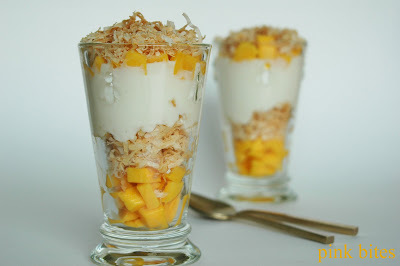 If the mangoes are not quite ripe, it might be better to wait a day or so to make the parfaits. *To toast the coconut, place it on a baking tray and toast it in the oven at low temperature. Be careful so it doesn't burn. It starts toasting around the edges, so shake the pan every once in a while. In a small bowl, combine the yogurt and maple syrup; set aside. 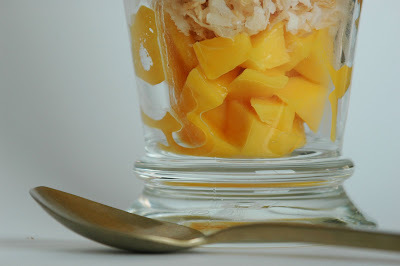 Divide 3/4 cup mango cubes between 4 parfait glasses. Top each with 2 tablespoons of coconut. Place 1/2 cup yogurt in each glass. Divide the remaining 3/4 cup mango between glasses. Garnish each glass with 2 tablespoons coconut. This is also my entry for this month's edition of Weekend Wokking, hosted by Precious Pea. The secret ingredient for September was coconut! Did you hear my intake of breath as I opened this post? Thanks so much for participating with such a gorgeous entry. Holler, this dessert is super fast to make, so you don't have to wait long! WC - Thanks so much, I find the WW challenges very fun to participate! Wow! Looks really good and so 'tropical'! Those look good! Nice photos. layering is one of my favourite way to enjoy dessert too and yours are unique and looks yummy!